5. Russian - The Russian language is spoken by 277+ speakers. It's widely spoken in other countries such as Kazakhstand, Belarus and sometimes even in the U.S. I'm sure Putin is happy with this. How to say mum in Russian: Mama which is the more common way and the formal way - mat - мать (m+ought). And the old fashioned way is 'Mah-tush-ka'. 4. Spanish - This is spoken by over 400 million people in the world. And that's no suprise is it? With many speaking Spanish across Europe and south America. This is slightly easier to learn than other languages. 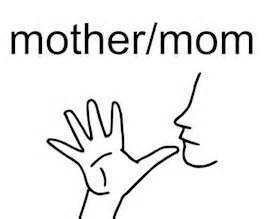 How to say mom in Spanish - Mama, or Madre (Mah-du-dre) which is the formal way to say it. Just don't say 'Mami' by mistake as this is similar to calling your partner 'baby' - 'mami' is a flirty term. 3. Hindustani in India - Over 500 million people speak this language. The language encompasses a huge dialect. So a very complicated language all in all. 2. English one of the top priorty languages in the World. With thousands of students learning to speak English every-day. Say mom in English - mum (British) or mom (American). The most formal way is mother. 1. Chinese Mandarin - This is the language that says mum, mother, mama, ma-mi, the most. With over a billion people speaking it and rising. Manadarin is a must for many people. Say mom in Mandarin - mama, that is it - very easy. So now I will teach you how to say I want a girlfriend. Wo-shiang-yao-yi-ge-nu-pang-yu. In conclusion - Ma is the safest term to use, if you ever need it of course, as it's the most spoken variation in the world. Try it now.